For the DJ/entertainer who wants semi-automated DJing, flexible ins/outs in software, and video and karaoke features, this is going to be on your shortlist, for sure. It’s clunky and feels dated, but it is powerful under the hood, and if these features are important to you, you will learn to live with its imperfections. The website is modern and clean, and lays out the versions you can choose from as well as lots of information about the app. There’s a forum with a relatively small but clearly committed user base, and downloadable mappings for scores of controllers, including lots of modern models such as the Reloop BeatPad 2, Denon DJ MC4000, and (coming soon) Pioneer CDJ2000 Nexus. You download the version that suits your system (PC/Mac, with a choice of 32-bit or 64-bit architecture), and follow an installation process. On our Mac, we were asked to install a legacy version of the Java Runtime Environment in addition, which is unnecessarily clunky and will panic the less tech-savvy, and ought not be necessary with modern software. Once past this hurdle, you are into a free trial (needs a reboot every hour), and get to choose whether you want to trial the “Home”, “Basic” or “Pro Entertain” version. You’ll almost definitely want the latter, as it’s the only one that works with Midi controllers, for a start. You can buy a licence at any time from within the app. 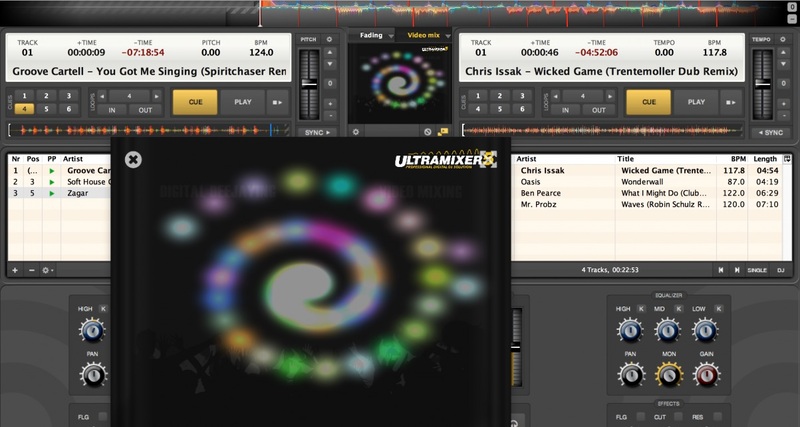 The twin playlist view is unique to UltraMixer, and will help busy DJ/entertainers to blur the line between mixing themselves and having the software do it for them. UltraMixer 5S Pro Entertain knows its market. 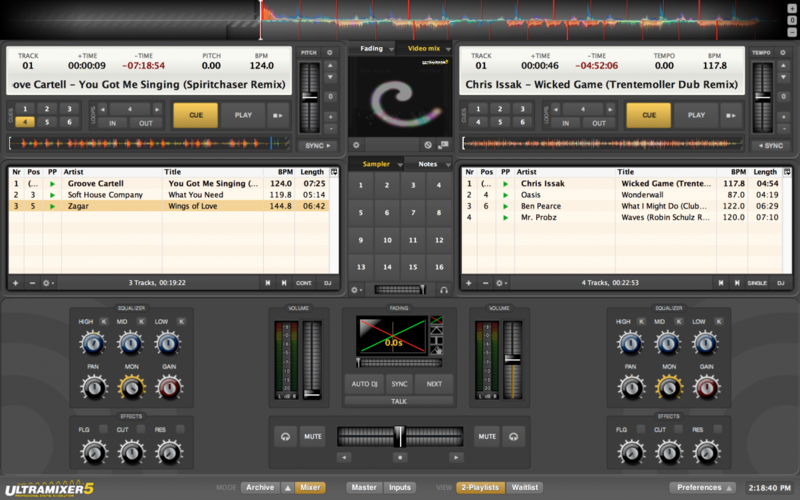 This is “entertainment software” as much as it is “DJ software” in the sense of club DJing, or “mixing DJing”, if you like. Sure, you can mix on it (it has waveforms, BPM analysis, tempo lock, sync buttons, cues, loops etc), but that’s not its reason for existence. Instead, it’s designed for the “DJ one man band” – the kind of entertainer who as I said in the intro may be conducting a karaoke evening, or providing the music at a kids’ party, or playing a wedding, or a providing video DJing at a sports bar, or compering a company corporate party. Sure, such a DJ may step up and “do some DJing”, but that’s only part of what he or she would want from a DJ program. Of course, if you don’t want any of this stuff, you can just play from a standard folders/files library view, and it has a waitlist where you can drag songs you want to play later. There’s also a “wishlist”, which would be a good place to store requests that you aren’t sure if you want to play but don’t want to forget. The software even has a “notes” panel, presumably for you to write down requets when they come in – a neat idea. If the playlist view isn’t for you, it’s possible to switch it out and go for a more conventional library view, which includes both a “waitlist” and a “wishlist”. So about the automix feature. It isn’t going to DJ like Carl Cox for you, but it is going to get you from A to B, which is all that is expected or required of the vast majority of mobile DJs. If you’re playing a dance set, you can tell it to sync the tracks as it mixes them for you (and to return to the new track’s BPM once it has, if you wish), give it limits as to the BPM differences it should attempt to mix in this way, or if you’re playing an open format set, tell it to respect the original BPMs. You can choose your crossfader curve type, and there are one-click microphone talkover and “next track” buttons so you can chat to your crowd or abort an unsuitable song while the software does the heavy lifting for you. Virtual DJ and djay Pro for Mac are two laptop programs that have automix too, but you won’t find it on software such as Traktor or Serato, so here’s one example of where UltraMixer differentiates itself from much of the “mainstream”. Another is video and karaoke mixing. 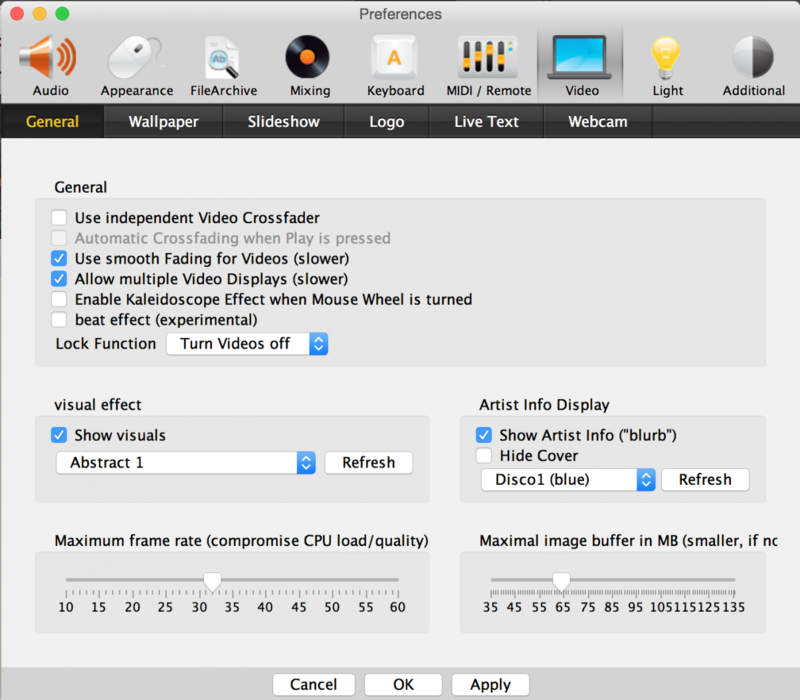 Several programs offer video mixing too, but UltraMixer’s is very flexible. You can mix karaoke files and have lots of options about where the lyrics are disaplyed, but you can also have a live slideshow (just point the software to a photos folder – great for a corporate party or kids’ birthday, for instance). You can easily put text on the screen and brand the screen with your logo (or that of your client). And the program has a huge choice of beatmatched visuals too. you can even have a clock on the screen, or set it to display artwork or info about the music that’s playing. Oh, and if you have a webcam, you can choose to stream that through your screens, too. How good would that big with a projector at a wedding, for instance, to put the speeches on the big screen? Or the CEO’s chat before everyone gets drunk at an office party? This version has an all-new video engine in “high resolution”, with MP4, AVI (DivX, XviD, MPEG1 and 2, H264, H263, H265), MPEG, FLV, MP3 + G (CDG), VOB, FLAC (also HiRes), WMV and MOV. The mixer has the usual controls you’d expect – three-band EQ with kills, gain and monitor level, a pan control, and rudimetary but workable FX (a one-knob flanger, and a LP/HP filter, with separate resonance). It’s pretty much all you’d need bar a reverb or echo, as the latter would be nice to have for applying to external mic inputs, for instance. I’m surprised it isn’t included. Talking of external inputs, there are three available to you (audio interface permitting, of course), each with three-band EQ, gain, monitor, pan and master volume, and these “pop out” when you hit the “inputs” tab at the bottom. This is where you’d have a couple of microphones, or the feed from some other entertainment (sports even, etc) were you wanting to have that running through your DJ mix. Also on a tab at the bottom of the screen is the Master Output section. this is unusually fully featured, again with stuff that mobile DJs and those working in installation-type venues where the remit is more than just a “one hour DJ set and outta there” type deal would appreciate. So you have a fully featured broadcast section, preconfigured to let you webcast via SHOUTcast, Mixlr or Icecast, from where you can also record your set (you can choose MP3/WAV and specify bitrate for the former). There is also a master compressor/normaliser here, something I believe is unique to UltraMixer, which would be useful for broadcasting but also for reining things in at a gym or when using UltraMixer in an office environment, for instance. And if “Attack”, “Release” and “Threshold” mean litle to you, there are presets for most usual scenarios here. Look at the bottom third of the screen here: There you can see the output controls, including graphic equaliser, broadcast/record functions and even a compressor/normaliser. And last but not least in this section is a 31-band graphic equaliser, which is a fantastic addition for DJs who quite possibly have to plug directly into a PA system with no mixer between them and it; this way, not only can you spend a bit of time EQing the room (let’s face it, most mobile gigs don’t have the luxury of a great venue acoustically, a great soundsystem or a great sound engineer to get the most out of that sound system…), but once you have, you won’t need to clunkily compensate using your in-app three-band EQ, as many DJs end up doing. (Ever played a gig with the bass all the way up all night long on your software mixer due to terrible sound in the room? Yup, us too..). As alluded to earlier, the software’s weakness is definitely in the “club DJ” style sections; the BPM engine is convoluted and not as good as most, the waveforms are colour but sub-par compared to say Serato’s, and of course there are only two decks. It’s way behind the times in this area – but nonetheless it’s easy enough to mix on it, including manual beatmatching, even without a DJ controller; I was doing it fine within minutes. There are a few bells and whistles: There’s a sampler with 16 slots (all the usual cheesy horns, an even more cheesy wolf whistle, and several “types” of applause and crowd noise – these guys know their market), and of course you can replace the samples with whatever you want (idents etc) very easily. There is also a batch of “Special FX”, which contains things like backspin, vinyl brake etc, but these are of limited use (for instance, the backspin is over in about half a second, and then the track carries on playing; it would be more useful if the track actually stopped). There’s no “slip” mode (fair enough), but also no censor button, something I’d have thought would have been very useful for mobile DJs. The preferences panel contains a lot of the software’s strengths, including a plethora of performance features plus full keyboard and Midi mapping – even lighting control. “Behind the scenes” (think deep in the preferences), it’s clear that a lot of thought has gone into letting pro users tweak this software for the best performance in public, because the search is (apparently) lightning fast even with big collections, there’s a “turbo boost” button to force priority for this program over any others running to help smooth out performance, and options for latency, time-stretch quality, scratching quality, database perfoemance, keyboard shortcuts and even lighting control. This is not for club DJs. Instead, this is a program to consider if your world is video, karaoke, being on the microphone, conducting gym sessions, dance classes, party games, playing music videos, handling speeches – basically curating public entertainment. If this sounds like you, something like UltraMixer is a better choice than the mainstream club programs. If you’re expected to take live feeds from elsewhere, maybe re-broadcast what you’re doing, plug directly into a PA and make it all sound good, again you’re covered. What it lacks in polish it makes up for in flexibility. Also as I said above, it is possible to mix in the traditional sense on here (beatmixing, etc) and that is augmented by adding in a controller; we used it with the BeatPad 2 from Reloop, and there are lots of choices of hardware, the list also growing all the time. 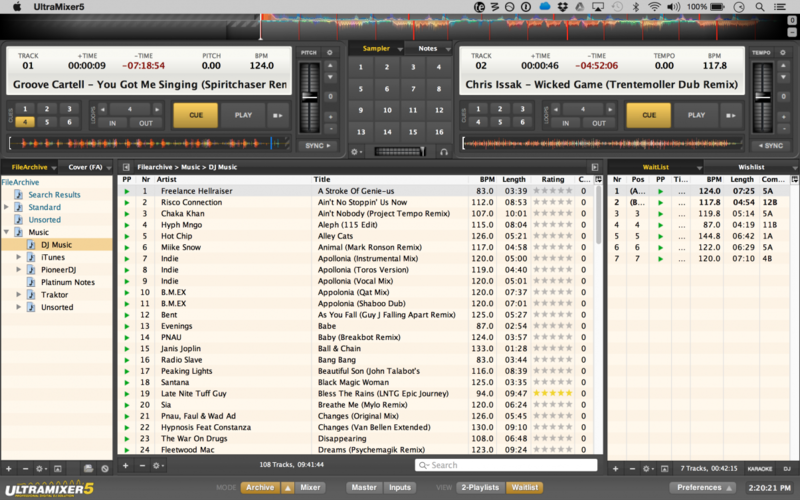 But in number of decks, and number of “club mixing” features (FX, waveform quality, slip mode etc), the software is way behind dedicated club DJ programs like Traktor and Serato, but also Virtual DJ, one of its obvious rivals. 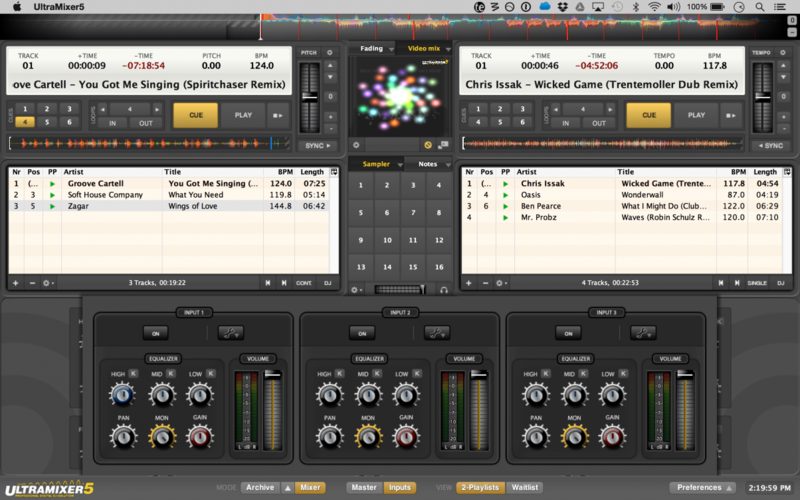 But not even Virtual DJ has the same flexibility in inputs and especially outputs (EQ, compressor) that UltraMixer has. I can see it appealing to venues where they have a permanent set-up (ie the computer doesn’t leave the DJ booth), and to mobile DJs who own all their own gear, too (so you could have a set-up with this, a decent sound card for your ins and outs, a lighting rig with control from within the software, and all your wired and wireless mics etc in a configuration you’re used to using with the software time and time again). And of course if you’re a pro, you won’t baulk at the rather steep $199 asking price for the full version, either. You may even want to take them up on their annual $99 phone/email premium support service, which I imagine has got many a professional performer out of a hole over the years, hence its prominence on the website. One thing it does promise but that I couldn’t find was direct search/mixing from YouTube. The mind boggles (Would you want to? Legalities? etc…) but we couldn’t find it in the software. It’s quite possibly pilot error, so we’ll come and update this paragraph if we find out any different. For now it’s an intriguing response to something like Virtual DJ’s cloud music system for streaming requests etc that you don’t actually own. Here in the bottom third of the screen you can see the three fully featured software input channels, primarily for microphones we would guess. Ultimately this is a niche program, but it knows its niche, and it serves it well. It is behind the times with regards to its appearance and also its slickness (the waveforms jumped about no matter how we set up our year-old, powerful MacBook Pro with it), but that would be forgiven by people who want this rather specialised feature set. They do need to sort out the Java thing on installing, but again, the program assumes you’re technical enough to operate the kind of pretty complicated DJ/VJ/KJ system it shines at controlling, so maybe that’s not a huge issue. Basically, if you’re a DJ/entertainer and you’ve been considering a program like Virtual DJ or PCDJ, this should be on your shortlist too for a detailed feature comparison before deciding. As you can download the full version for an unlimited trial (all it does is quit every 60 minutes), you can find out for yourself if it’s for you.